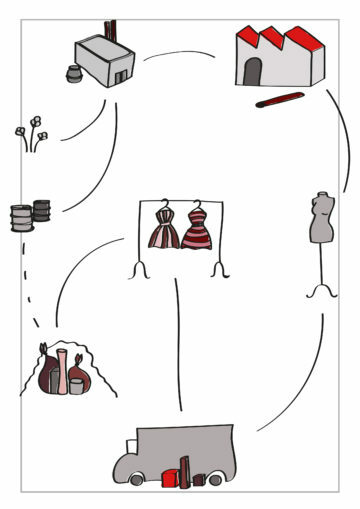 Basically, the textile process is very simple. Fiber are needed to make fabrics. These can be of natural as well as artificial origin. Known examples of natural fiber are cotton or linen. Synthetic fiber are polyester or viscose for example. There will be a separate article on the subject. After all, there are a lot of fiber types and they all have different meanings and uses. Yarns are spun from the fiber just mentioned. These look like the yarn, that we know, like thin strands for sewing. In the next step, the yarns become textile surfaces. Basically, textile surfaces are ordinary fabrics. The technical term is always on my tongue, but I also could just say „fabrics”. Some substances are refined. It is fiber and yarn dependent, which finishing process can be considered. To clarify my reasoning, I will introduce you to a well-known procedure: Jeans are often subjected to a process called “stone washing”. This helps the jeans to become softer and more flexible. In addition, the pants then looks like used. During the process, the fabric is roughened with stones and rinsed out. Hard to imagine that the jeans were once a workers pants without any aesthetic requirements. Sometimes this refinement is made only after processing the seamstress. In the next step, the textile surfaces are then given for further processing in the clothing production. Often this does a new factory. Large clothing companies have several factories that share the tasks. The finished fabric rolls are laid out. On these the prefabricated patterns are applied. Here, too, it depends on the size of the company, whether the fabric is cut by human hand or machines by laser cut. The most demanding step is probably sewing the pieces together. This task is also fulfilled by several approachers. This ensures that a seamstress can memorize a step and translate it very quickly. Large chains also have large purchase quantities. It can happen that a seamstress sews the same shoulder seam for one week – eight hours a day. After the garment has been sewn, it is ironed. The devices that are used are by no means similar to the devices you use at home. Often these are large ironing machines that look like a press and also work that way. Sewn and ironed clothing is packaged and shipped to retailers. That’s all – that’s the process of the textile chain. By the way: Sewers often leave the “ironing stitch”, which is often a cross on a slot that holds it together. This thread may be pulled out skillfully. He has nothing to do with the workmanship, nor with the design – it’s just that the slot does not fall apart when ironing. The same applies to slash pockets – often these are sewn together. You may carefully pull them apart, then the seam will detach automatically and the bag can be filled.